To some, starting a bathroom remodeling project seems too hard to do. Part, or most, of the reason for this relates to the financial aspect of this endeavor. Financing a remodeling project can be challenging for many people. Often times, a project is not started as a result of the lack of funds. However, a Bathroom Remodeling Calculator can help in this regard. Downloading a template that is designed to help with making calculations is quite beneficial. In fact, it can help people recognize that such a remodeling project is attainable. Here are some things to consider when looking at a bathroom remodeling project. Before someone is to use a Bathroom Remodeling Calculator, it is important to have an idea of items that will be in the remodeled bathroom. Perhaps a shower will be replacing the current bathtub. The closet could need a major expansion to become a walk-in closet. The possibilities are nearly endless, and it is up to the individual or couple to determine what they want. Once they have determined what they want, the process can begin by looking at the template. One of the great benefits of using this template is that people can download it free. Some templates require payment in advance to use, but that is not the case with this one. Next, the template can be customized to what a couple or an individual needs. This can save people a lot of time when filling out the template. 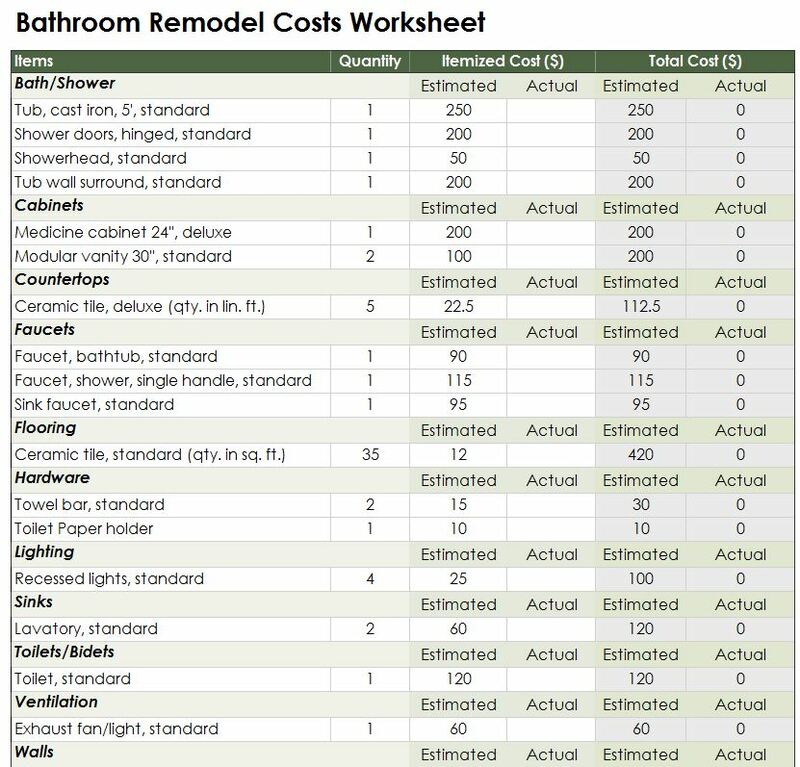 Finally, the Bathroom Remodeling Calculator template is easy to use. Unlike other templates that are complicated and difficult to change, this template allows people to take their time in looking and understand it. In addition to this, individuals have the freedom to take away or to add new categories to the bathroom renovation template. Keep in mind that the Bathroom Remodeling Calculator is intended to help people create a real budget for the project. Therefore, a list of detailed items makes the process straightforward and to the point. The estimated and actual price for a certain item can help people identify whether they are more likely or not to guess high or low on prices. This can be valuable information in the future, when considering whether to remodel a bathroom. The Bathroom Remodeling Calculator works best when each item is listed and categorized.